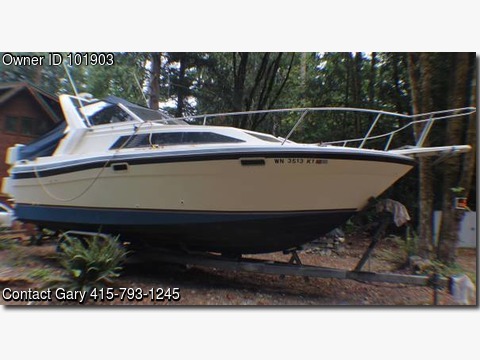 Boat is located in Hoodsport,Washington.Please contact the owner @ 415-793-1245...Great boat for week or weekend in the Puget Sound The best Twin engines Vovo Penta 225, with Vovo Out drives with duel props, It does 'nt get any better that this, little over 1000, hrs on each motor. New Exhaust and Risers, Plug wires and tune up. New Bateries, Run great no issues ready for the water, I have redone the sky bridge and the interior, looks new. Snap in carpets on deck and sky bridge, Full canvas with many options to use. On a Calkins galvanized trailer, duel wheels with brakes. May be purchased separately $3000.00 Would consider a 21 to 24 ft cuddy as partial trade.